Steve Campbell uses his 1925 Chevy utility truck for errands and enjoys driving it in parades. The truck, once used for deliveries in Ohio, has just over 18,000 miles on it. 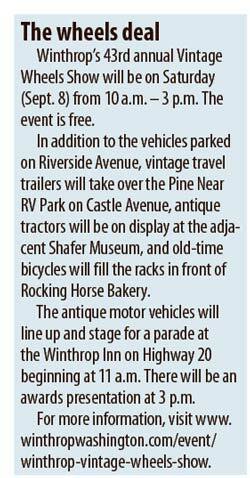 Devotees of old cars, trucks and bicycles — collectors and fans — are gearing up for the annual Vintage Wheels show in Winthrop this weekend. Steve Campbell of Winthrop was dusting off — literally — his 1925 Chevy utility truck, which, in its 93 years, has clocked only 18,000 miles, the majority of that making deliveries during its first decade in Ohio. “I’ve never washed it — I just blow the dust off. It’s more of a parade truck than a car-show truck,” said Campbell, who uses it for trips to the hardware store and the post office. “Some people walk right by it, but others go crazy,” said Campbell, noting that his utility truck — tricked out with a wooden pitchfork and shovel and an antique pickle barrel — is different from the spotless classic cars and hot rods that make up a good share of the show. 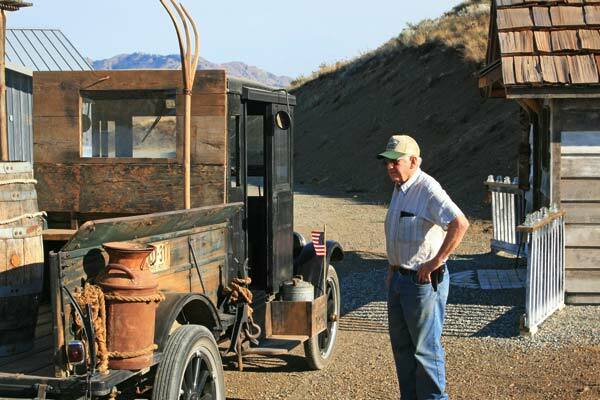 When Campbell bought the truck 15 years ago from the great-grandchildren of its original owner, they sent along a copy of the original bill of sale. In 1925, $550 would get you a 1-ton Chevy truck, although the box frame, roof and truck bed were extra, he said. Campbell has outfitted the truck with family mementos, including manual turn signals from his father’s 1933 Model B Ford. It was Campbell’s job to flip the turn levers when he was a boy. Campbell also picked up an old tool for changing split-rim tires, replaced the wooden roof with a canvas top that is “somewhat waterproof,” and glued the wooden steering wheel back together. The windshield — also original — is single-strength glass, “the kind you don’t want to go through,” he said. The truck has beefed-up gears so Campbell can make it up his steep driveway. Because it only has rear brakes, he keeps his top speed under 30 miles per hour. In its 43 years, the auto show has evolved from a classic-car show — mainly Rolls-Royces, Model Ts and Packards — to include hot rods, tractors and dragsters, said Mike Sweeney, one of the founders of the event. Today the show also attracts collectors of vintage trailers and bicycles. Some exhibitors may even bring their take on rat rods, where people assemble a vehicle from different parts. A rat rod could have a Model A body mounted on a ’48 frame, outfitted with a nice chassis and a good engine, said Sweeney. This year Sweeney will be showing his gleaming black 1932 Ford roadster. Awards at the show have also changed. They no longer give prizes for best chrome, best paint, or best tires and wheels, but local businesses award trophies to their favorite vehicles, and the public votes for people’s choice, said Sweeney. Darold Brandenburg, a local car aficionado who can see a gem in what may look like a rusted heap of metal and broken glass, will miss the show for the first time in years. “It’s really fun to go, to see what people have done to cars that’s just amazing. There’s always one car that makes you feel good,” he said.